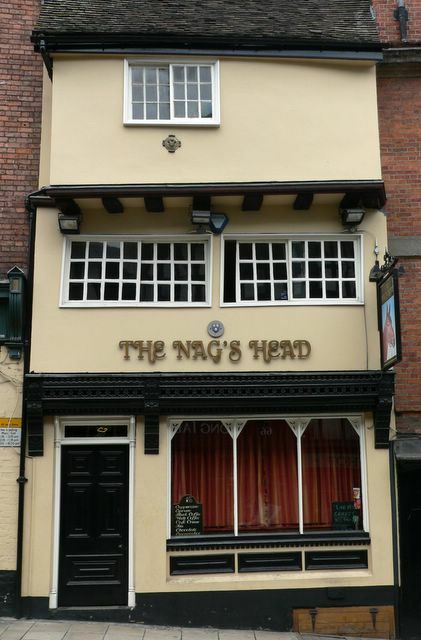 About halfway up the hill you will see the Nag's Head pub on your right which has a most unusual haunting. Look up at the little window on the top floor. Within this room there is a cupboard and within the cupboard is a painting -- and it is actually the painting that is haunted. The painting is of an old prophet and it's said that anyone who looks at it will be driven mad. Certainly, there have been three occasions in the past when people, perfectly sane and seemingly perfectly happy, have stayed in that room and then, for no apparent reason, committed suicide. One was a man who had just been promoted, another was a young girl looking forward to getting married and the third was a First World War soldier who had just returned from the front. Not surprisingly, the cupboard is always kept locked so that no one can inadvertently see the painting these days. The pub has more normal hauntings too. Some work was being done on the building in the early 1980s when a previously unknown panelled room was discovered. Opening the room must have released the ghost associated with it. Perhaps he was also the man in the "funny long coat and hat who came through the wall" that a young girl once saw there. Armed and dangerous dolphins are missing. Dawn in Shropshire, taken from my B&B window. Owl at Ray's Farm in Shropshire, UK. Boston Harbor, Labor Day, at dusk. Physicists vs. Sociologists, oh my.